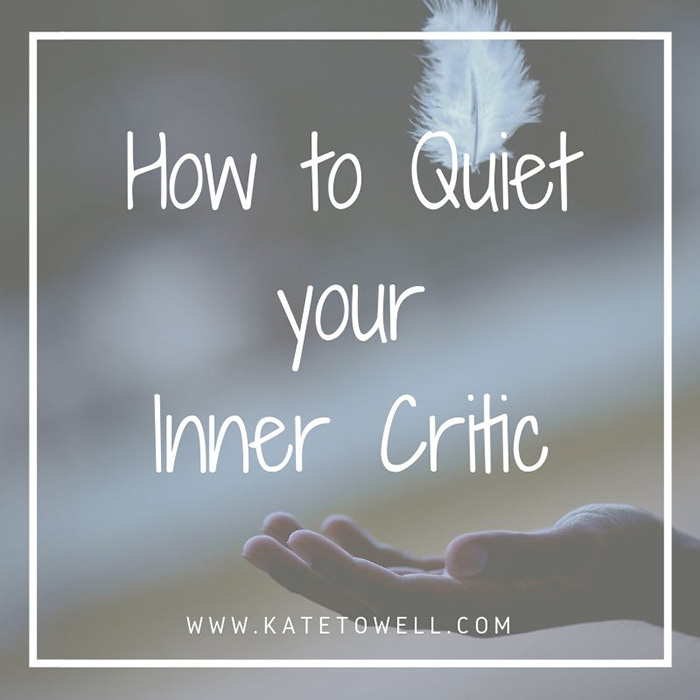 How to quiet your inner critic. Photo courtesy of Kate Towell. Most of us know that taking good care of ourselves involves eating whole, unprocessed foods, maintaining a daily rhythm that includes adequate sleep, staying hydrated, exercising and doing some kind of self-care ritual on a regular basis. But self-care and happiness actually involve a lot more than just the physical stuff. Our mindset and how we “talk” to ourselves plays a huge role in our overall sense of wellbeing. According to Ayurveda, how successful you are in creating the healthy lifestyle you desire is largely determined by your thoughts. As someone with a lot of fire energy (hello pitta girl), I have a strong inner critic. At the of best of times, my sharp critical nature has a vision for change, gets stuff done, keeps me on schedule and is organized. However, my inner critic can set the bar so high that I feel doomed to failure and fall prey to the attitude that if its not perfection, its crap. Before I started practicing yoga and meditation on a regular basis and adopted an Ayurvedic lifestyle, I spent years beating myself up and listening to that little voice telling me that I could always do something better. A couple of weeks ago I came across Dr. Kristin Neff’s research on the power of cultivating self- compassion, a longtime struggle of mine. Her studies have shown that people who practice self-compassion are happier, more optimistic, more resilient, have a more positive body image and express more gratitude then those who indulge in regular negative self-talk. She goes on to say that self-compassion not only helps you be kinder to yourself, but it also gives you the power to be kinder to the world around you. And couldn’t we all use a little more kindness these days? How do you cultivate self-compassion and overcome the inner critic? Dr. Neff explains it relies on three interconnected elements. Practice Self-Kindness instead of self-judgment. Neff suggests that we treat ourselves like we would a dear friend. But more than that, I think practicing self-kindness means realizing and truly believing that in every moment you are enough. You. Are. Enough. Choose connection and community instead of self-isolation. Letting go of comparison and competition is so challenging for a pitta personality but the benefit is that we come to understand we are not alone. Neff points out that suffering is part of a shared human experience and she invites us to slow down, appreciate our sameness and recognized that we all struggle. Cultivate mindfulness instead of indulging negative self-talk. There is no overcoming our internal critic and negative self-talk unless we acknowledge it. Mindfulness can be defined as witnessing ourselves in the moment without judgment and with loving kindness. It is the tool that allows us to see our patterns and transcend them. Neff advocates a balanced relationship with our inner critic by acknowledging it and making room for it but not allowing it to take hold. The more we can notice when we talk to ourselves in a way that is unkind or harsh the more we can say to the self-critic, thank you for trying to help me but I think I’ll try a kinder way of moving forward. As wellness seekers we know that self-transformation doesn’t happen overnight. But we also know that you can overcome negative patterns one step at a time if you are gentle with yourself and accept your setbacks with compassion. Maybe its time to embrace self-compassion as your greatest source of strength and the foundation for over coming the inner critic and creating vibrant living.